Is this the Bus for Us? 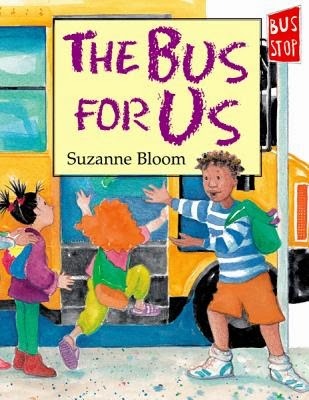 This is one of my favorite Suzanne Bloom books, so I can’t believe I haven’t written a review yet! What I love about this book: the way Suzanne Bloom uses a simple repetitive question as a refrain for the story. I like that the story is completely in dialog, and that as each vehicle passes by more children arrive. They bring animals and lunches. Crayons spill out of backpacks, and Gus gets increasingly tired of being asked the same old question: Is this the bus for us? I also love the way Bloom includes a diversity of children in her illustrations. Beyond the Book: Take your child – and a folding chair and a notebook - to the nearest bus stop and keep tally of all the kinds of vehicles that go by. Then when you return home, make a chart to show what sort of vehicles passed you by. It might be as simple as cutting pictures out of a magazine – or be more data-oriented, such as a bar graph comparing the number of cars, taxis, etc. Reader’s theater: this is a perfect book for group participation. You could begin with two children – one asking the question, “Is this the bus for us?” and the other responding, “No, it’s a ___.” Then another child joins and two kids ask “Is this the bus…?”. After answer, another kid joins until everyone in the group is asking: Is this the bus for us? Finally, the answer is yes and everyone “sits” in a bus and sings “Wheels on the bus go round & round”. Anagram search: Throughout the book the letters on the Bus Stop sign get mixed up. It starts off as a “Bus Stop” but on another page it’s a “Bus Post”. Find all the ways “Bus Stop” is rewritten…. And then play with some anagrams of your own. Today's review is part of PPBF (perfect picture book Friday), an event in which bloggers share great picture books at Susanna Leonard Hill's site. She keeps an ever-growing list of Perfect Picture Books. Review copy borrowed from a library. 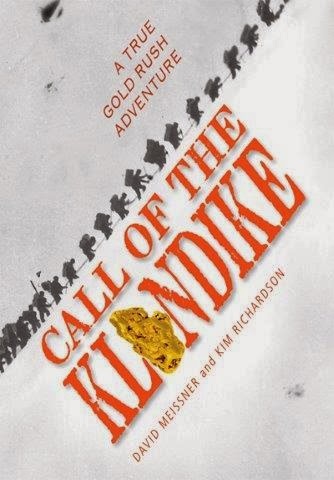 Perfect Book for Frigid Temps - Call of the Klondike! You don't have to read this book when the thermometer on the back porch reads double-digits below zero (Fahrenheit) - but wrapping up in a blanket and drinking hot tea does help set the mood for this arctic adventure. This is the perfect book to put in the hands of a kid who loves Gary Paulsen (Hatchet), Jack London (The Call of the Wild), or Robert Service (The Cremation of Sam McGee and other poems of the Arctic wilderness). The cool thing: this story is true! And illustrator Kim Richardson is the great-great nephew of Stanley Pearce, whose Alaskan gold rush adventures inspired the book. Stanley Pearce and Marshall Bond are two unlikely Cheechakos - both Yale graduates who just happened to be in Seattle the day in 1897 when a boatload of Alaskan prospectors docked, full of gold. Pearce and Bond borrowed funds from their families and headed north, over the Dawson Trail - which sounds much easier than it really was. Richardson's photos and David Meissner's storytelling provide a compelling narrative of life in the Alaskan Gold Rush. It is filled with journal entries, letters home, and comments about Jack London, who dropped in to say "hi" when he was up there. Fill your mug with hot cocoa, put on a parka, and read this book before the ice melts! This is Nonfiction Monday. You'll find lots more great nonfiction books at the Nonfiction Monday blog. It's also Marvelous Middle-Grade Monday - and you'll find more good middle-grade and YA literature over at Shannon Messenger's blog. Review copy provided by publisher. 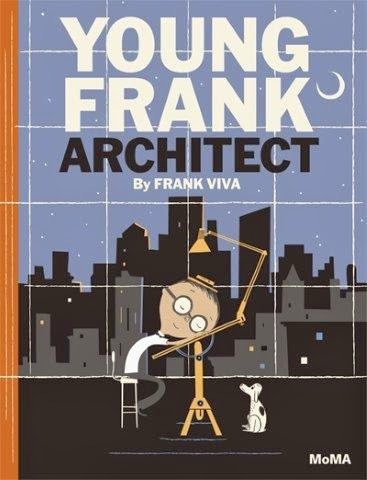 When Young Frank builds a skyscraper out of books, Old Frank says it is too wiggly; buildings should be straight. Seems like nothing Young Frank designs is “right”, and he decides to give up being an architect. But grandpa suggests a trip to the museum – the Museum of Modern Art – where they find a wiggly chair designed by an architect named Frank. Also a twisted tower by another architect named Frank. The book ends with the boy and his grandfather building things together. By the last page the apartment is full of things the two architects create. The drawings are whimsical, which helps lighten the story, and at the end there are notes about architects, including (of course) Frank O. Gehry and Frank Lloyd Wright. If you've got a kid who loves to build things out of blocks (or toilet paper tubes and cereal boxes) and also loves to draw, this book might inspire some conversation about the connections between creativity, art, and design. It might inspire him - or her - to draft a design before embarking on the next construction project. Remember to drop by STEM Friday for more books, resources and ideas. Review copy provided by publisher. During the Civil Rights movement, the Sixteenth Street Baptist Church served as a rallying place for Birmington, Alabama's African American community. Martin Luther King Jr. used it as his "headquarters" when he was in town speaking about desegregation and equal rights. Because of that, the church - and Birmingham - became a target for attacks... bombings that were threatening but not deadly. That changed on Sunday, September 15, 1963. Early in the morning, three Ku Klux Klan members planted 19 sticks of dynamite outside the basement of the church. At 10:22 am they exploded, killing four young girls - Addie Mae Collins, Carole Robertson, Cynthia Wesley and Denise McNair - and injuring 22 others. The young people had come to prepare for Youth Day. Rather than paralyzing the black community with fear, the bombing galvanized the community and guaranteed passage of the 1964 civil rights legislation. 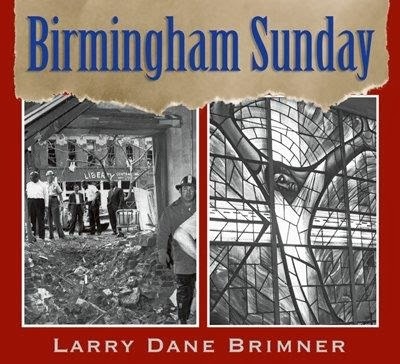 Larry Dane Brimner writes about Birmingham Sunday, putting it into historical context. From the Supreme Court's 1954 Brown vs Board of Education decision through George Wallace's 1963 inaugural speech, Brimner shows how segregation was woven into the fabric of southern life. Words and photos show the Good Friday march that led to King's arrest, the resulting unrest, and the eventual compliance with federal orders to integrate the schools. The Birmingham Sunday blast came just days later. Brimner does more than document the events; he brings history to life and puts human faces on the suffering. This thin book is filled with photos, biographies of the young people who lost their lives, and the struggle to find justice. "When I began my research, realized that Addie Mae, Cynthia, Carole, and Denise were almost always referred to as the 'four little children'," Brimner writes in his acknowledgment. He did not want their names to be forgotten to history. Nor did he want the other two children killed that day, Johnny and Virgil, to be forgotten. This is Nonfiction Monday. You'll find lots more great nonfiction books at the Nonfiction Monday blog. Review copy from my personal library. "It is twilight in the desert," writes Pringle. A lizard scurries to the safety of the rocks when, "Suddenly it is grabbed by a scorpion's powerful claws. The lizard struggles. It tries to break free..."
But we know what is going to happen. That lizard is toast... or at least dinner. There are almost two thousand different species of scorpions, and they live in a diversity of habitats: tropical forests, seashores, deserts, high mountains, and even in deep dark caves. Four hundred million years ago scorpions measured three feet long... modern scorpions are not quite so large. By the time you get to the end of the book you know how many legs and eyes scorpions have, how their mouths are designed for ripping apart prey, and how desert scorpions can move across hot sand. Pringle shares a list of things they eat (anything that moves, including other scorpions) and gives us a glimpse of family life. Scorpions have courtship dances, exchange scorpion kisses, and give birth to live babies. Yes, baby scorpions don't hatch from eggs like other arachnids. they even ride around on their mom's back for a short time while their cuticle hardens. But then it's time to scatter and hunt on their own. 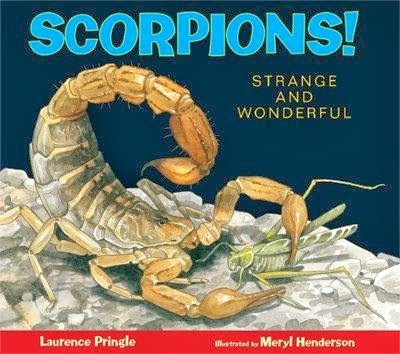 "Real scorpions," writes Pringle, "...are fascinating creatures, vital in their natural habitats, and full of secrets yet to be discovered." Today is STEM Friday - head over to the STEM Friday blog to see what other people are talking about in science. Don't step on any scorpions on your way! Review copy provided by publisher. How can you resist a book that opens with a chapter titled "Disaster Boy"? 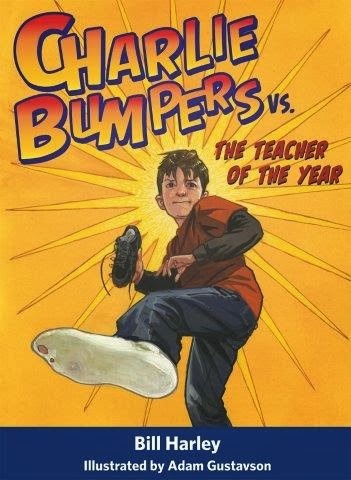 And a main character - Charlie Bumpers - who means to keep things neat, but then something else happens. Who also finds out that his new teacher is Mrs. Burke, the "teacher of the year"... not only the strictest teacher in the whole school, but also the teacher Charlie hit in the back of the head with a sneaker last year. By accident. Fourth grade is going to be a tough year for Charlie! And starting the year off with a pair of new sneakers he hates is just the beginning. No matter what he does to get on Mrs. Burke's good side, something else happens. Like the toilet-paper fiasco... it started off as a good idea, but then... something else happened. Then there's the soccer ball rescue operation. How will Charlie survive a whole year without being banished from recess - or worse? Storyteller Bill Harley (who also sings funny songs) has written a spot-on story about the large fears and small victories that fill a fourth grader's world. But there's more - Charlie has his own blog, where you can get the recipe for his favorite food (train wreck) and see the trailer for this book. This is part of the Marvelous Middle-Grade Monday round-up. Check out more great reading here. And drop by in March for a blog tour of the newest Charlie Bumpers book. Review copy from publisher. This is the story of Issa, born in 1763 on a farm in central Japan. He began writing poetry as a young child, inspired by his love of nature. At one point in his life he spent seven years walking across Japan, composing poetry along the way. He wrote more than 20,000 haiku and never lost his love for the little things. of dew in the morning grass. Once, writes Gollub, Issa saw watermelons left outside in a tub to chill. He felt sorry that someone would eat them up, and wished that they could hop away. 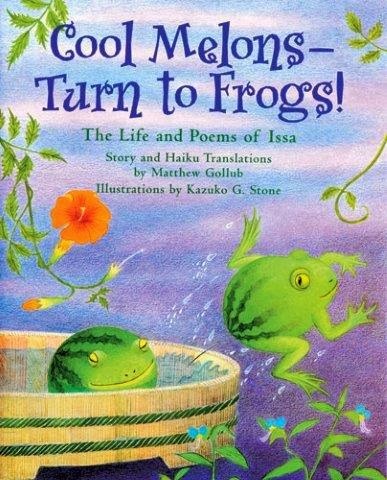 What I like love about this book: the delicious combination of text, haiku and artwork. In addition to lovely watercolor paintings, Kasuko Stone paints calligraphy down the margins. This book is fun to read and inspires one to grab a pencil and a camera and head outside to see what treasures the world holds. … creating haiku postcards. These are short haiku descriptions of places you’ve been; cool fungi/rocks/bugs/flowers/animals you’ve seen; a weather report for the day; seasonal observations (migrations, leaves falling). …going on a haiku hike. Grab some index cards and write short haiku observations of things you see. This is a great activity for building science observation skills. …carrying a haiku in your pocket. Find a cool haiku that you like and copy it. Maybe use a calligraphy marker so it looks cool. Put it in your pocket and, when you see someone you want to share it with, give it away. … writing a cookie fortune in haiku. Fortune cookies may have been invented by a Japanese American who enclosed thank you notes in his grilled rice wafers. … combining haiku with drawings or photography. That art form, called haiga, began as paintings that embodied the sensibilities of haiku. … linking three or more haiku “verses” together in a longer poem. Today's review is part of PPBF (perfect picture book Friday), an event in which bloggers share great picture books at Susanna Leonard Hill's site. She keeps an ever-growing list of Perfect Picture Books. On Monday I'm joining other bloggers for Nonfiction Monday - check out that blog for more great books. Review copy from my personal library. 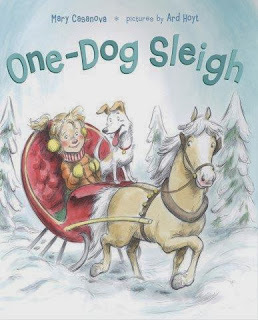 This is a fun, cumulative story that begins when a girl hitches her pony to her little red sleigh and invites her dog to hop in for a ride. "Just me and you in a one-dog sleigh." But all those passengers help out when they've got to get to the top of a hill... and then it's smooth sailing downhill - until they hit a bump. And with a thump it's just "me and my pal in a one-dog sleigh." "On a cold, gray day, Old Man Winter walks out to his barn and opens the door." Inside are his white ponies, impatient to get outside for a romp. They flow out of the gate and into the woods. The ponies are playful, full of energy. "In a flurry", they canter... they thunder through the woods and frolic, rear and race. Clouds of snow whirl around them. Their play grows wilder as they gallop and leap over fences. Eventually they tire and drift back to the barn. What I like: This book is full of wonderful language and imagination - a perfect read for sitting in a big chair with a mug of steaming cocoa. While the wind blows the snow outside, the snow ponies flurry and drift across the pages. In the end they quiet down and peace falls across the snowy landscape. Beyond the Book : I've never seen a Snow Pony, but I have heard their whinnies in the wind, and felt them rush by in a hurry. This is a great book for opening creative play or writing some poetry about the snow. The ponies in this book romp and jostle and canter. Go on a word hunt to find words that express different ways snow ponies could move. Then try out some of those movements. If you've got snow outside, put your boots on and gallop and canter through the snow. Then look at your tracks. Are your footprints spaced farther apart when you gallop than when you walk? If you can't go outside, then cut paper snowflakes and decorate them with glitter. Or make some popsicle stick snowflakes. Make your own snow ponies! If you have some toilet paper rolls (or gift-wrap rolls) and yarn and string - and some nuts or bottle caps for hoofs, you can make a snow pony marionette. Directions at Red Ted's Art Blog (his is a unicorn). Or if you have a horse cookie cutter, bake up a herd of snow ponies and decorate them with frosting and sprinkles.